Broadley Farm Cottages01873 890343work Self-cateringSituated on a hillside farm in the Brecon Beacons national park, overlooking Llanthony Valley and near the ruins of the 12th Century Priory. These lovely cottages are perfect for walking, pony trekking, painting, or just relaxing in the most peaceful surroundings. Oak cottage has a superb view across the valley. Ideal for a couple, this open plan ground floor cottage is really warm and welcoming. It has a beautiful oak floor, under-floor heating and a wood-burning stove for cozy evenings. You can lie in bed and watch the flames in the stove! Bright and cozy with large fireplace and heated flagstone floor. The French windows open onto magnificent views. The kitchen is equipped with integrated fridge and cooker. The cottage is mostly furnished with antique pine.The back door opens onto a pretty cobbled garden, ideal for breakfast. Situated on a hillside farm in the Brecon Beacons national park, overlooking Llanthony Valley and near the ruins of the 12th Century Priory. These lovely cottages are perfect for walking, pony trekking, painting, or just relaxing in the most peaceful surroundings. 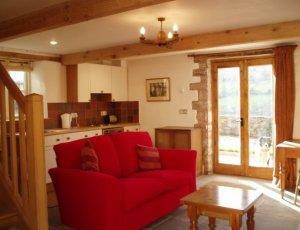 Flagstone Cottage is suitable for guests with dogs. Children welcome from any age.